Are you getting bored of having your standard Suhoor meals over and over again every single night? Whatever you chose to eat during this time of day, this meal is supposed to fill you up for a longer period of time and not make you thirsty of course. Our friends at ChefXChange have compiled a list of easy and out-of-the-ordinary Suhoor recipes which will give you tons of energy and won’t make you thirsty. The best part is that all these recipes can we prepared in advance! Make sure to book a Helpling cleaner as well to give yourself more time to prepare proper and healthy treats instead of spending your time cleaning up after the Iftar and Suhoor mess. Not only are these small wraps perfect if you are hosting a Suhoor but they also require minimal effort from your end. The cucumber will balance out the saltiness of the cheese which is ideal to minimize your thirst for when the sun comes up. Read full recipe here. French toast sticks are also great because you can cook them in advance, freeze them and take them out whenever you are having a craving. Let’s all be honest, after all this Iftar cooking and things happening in the evenings during Ramadan, nobody has the energy or the time to cook anything after a certain hour. Hence why these french toasties are ideal. Try this recipe here. Oatmeal is also a great evening treat! Not only can it be prepared ahead of time and can be stored in the fridge for a few days, its also a great healthy option that will fill you up real good. Don’t forget to play around with the flavors and add in whatever your preferences are (fruits, nuts, etc…). Have a look at this recipe for some more oatmeal inspiration. Another oatmeal recipe that is great for Suhoor is blueberry oatmeal cups. Not only do they look delicious but they are also really tasty. Just like muffins, these can be baked ahead of time and you can just grab one whenever you are feeling hungry and crumby. Blueberries are also very rich in antioxidants which is great for your skin. Full recipe here. Not all “guilty-pleasure” muffins are full of calories! Muffins in general are your way to have dessert for breakfast, which is pretty ideal. Healthy and whole-grain based muffins can actually go a long way during Suhoor. This special recipe uses apples, carrots, coconut flakes, chewy raisins and walnuts. Don’t these muffins pictured above make you want to go to the kitchen and bake a batch right now? You can find the full recipe here. Make sure to only add a hint of brown sugar, and don’t go overboard. This recipe is definitely an “out of the box” one and it’s so worth the try! 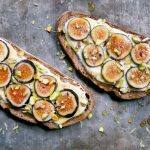 If you are feeling energetic and adventurous, try this yummy ricotta toast with figs on top. Sprinkle some lemon and pistachios and don’t forget to drizzle some honey on top for en extra healthy touch. Full recipe can be found here. Whether we like it or not, all kinds of cooking and baking will create a mess in the kitchen, no matter how clean and tidy you try to be during your cooking. This is why Helpling is here providing you cleaning services to clean up the mess the morning after your Iftar & Suhoor. 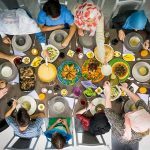 … And since we know cooking during Ramadan can get very hectic, why don’t you check out all the chefs from ChefXChange who would be delighted to cook for you for Iftar and/or Suhoor.